If pen and paper don’t mean much to you in this iPad- and iPhone-based era, then no need for a hands-on trial. But if you have an appreciation for fine papers, Moleskine Journals, Behance Creative Outfitter, good vellum, and ink that glides you do want a test drive and Hands-On Pen Promotion In-Store. 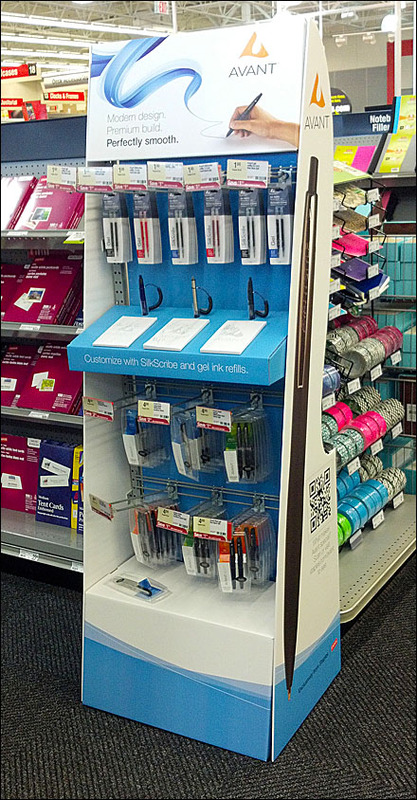 This corrugated point-of-purchase display provides three choices and trial workstations. Even the paper stock was psuedo “watermarked” to drive home brand name. See the Hands-On Pen Promotion In-Store thumbnail for an overview. All pens had a leash so that they did not accidentally walk away from the display.